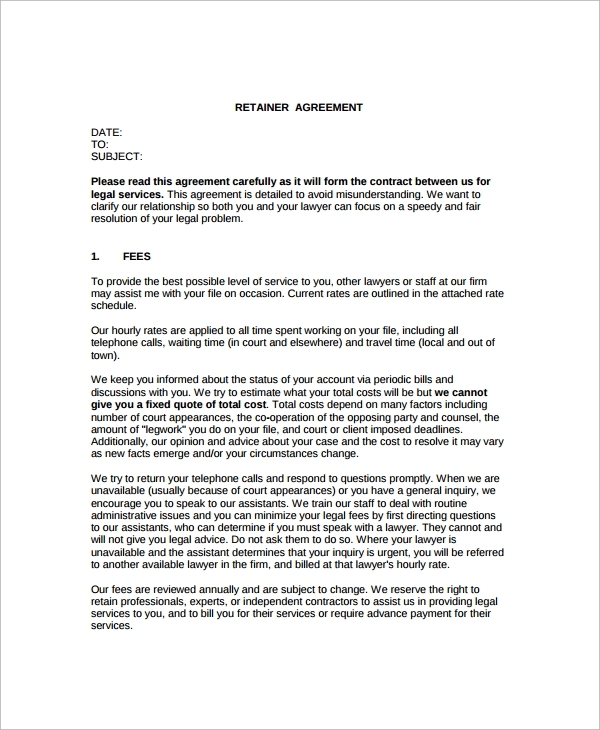 Retainer agreement is a work for hire Loan Agreement. Normally a consultant company or individual is engaged to perform a particular job for a certain time period or on some specific occasions against a pre-determined fees or remuneration. The specifics of responsibilities, schedule under which such responsibilities will be delivered, the compensation to be paid, the conditions attached with such compensation, and all other special clauses are the part of the Retainer Agreements. 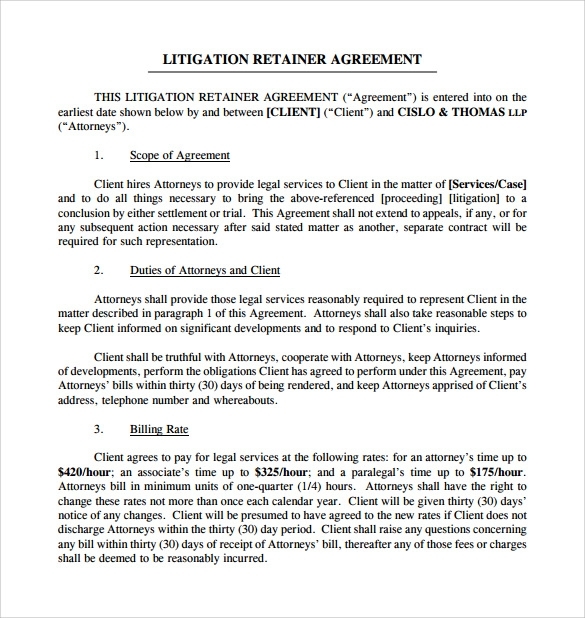 A sample retainer agreement shows how to write the most effective retainer agreement lawfully so that the consultant is bound by the terms and conditions of the agreement and both the parties get a vivid picture of their respective obligations. 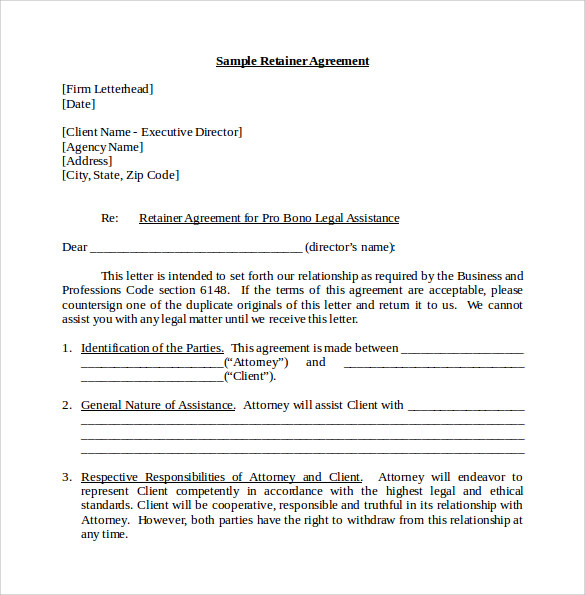 This template is available in PDF format and is best suited when there is an agreement regarding a job to be done by a firm and the involved client. It can be downloaded for free and can be customized according to personal needs and requirements. This template is a short and crisp agreement between the worker/s and the client was they are required to sign upon agreement regarding the mentioned clauses about the method of payment, hourly allowance and many more technicalities. This template is a 9 page PDF file which discusses elaborately the scopes and duties, deposits to be made, legal fees, contacts, communications, discharge and withdrawal, liens and adjudications, turnover, completion and deletion of files and many more subheadings. This template is available in a 4-page PDF format with around 18 clauses discussed in it. At the bottom of the file is the receipt and lined blank spaces for the signature by both the consented parties involved in the deal. 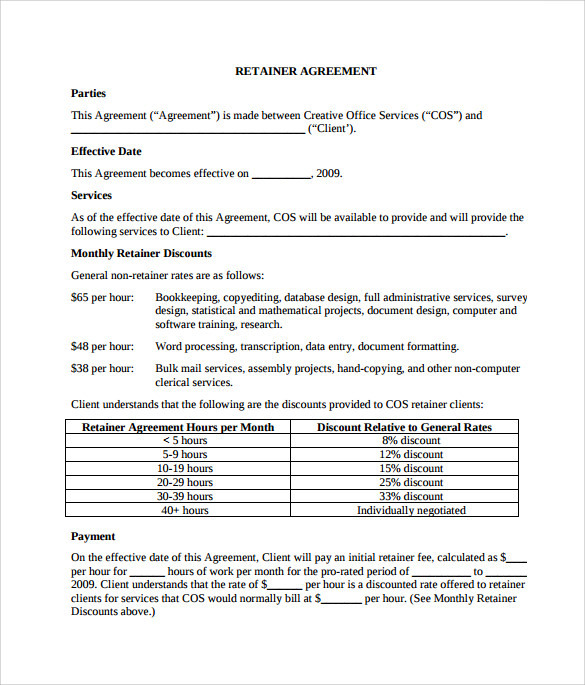 Why Do You Need Sample Retainer Agreement Template? Freelancing jobs are often required for short-term basis jobs. Hiring someone permanently might be counter-productive in such cases as they would incur more costs and would effectively be a major loss. If chosen wisely, freelancing jobs will ultimately be more beneficial than you may imagine. 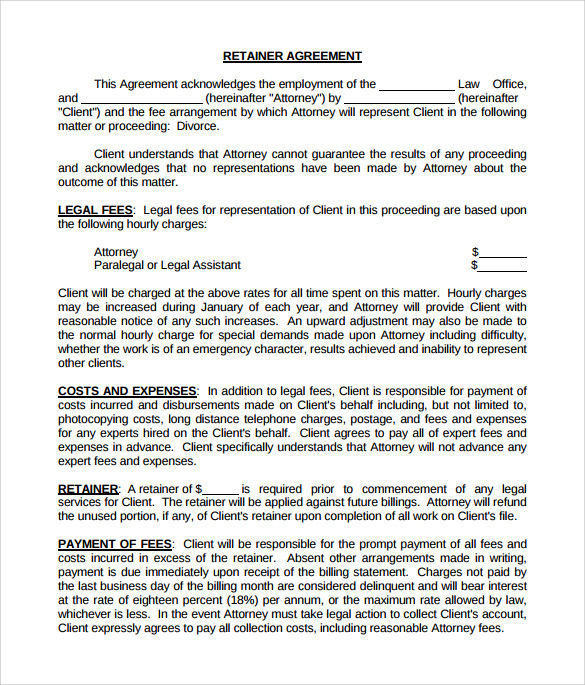 When Do You Need Sample Retainer Agreement Template? 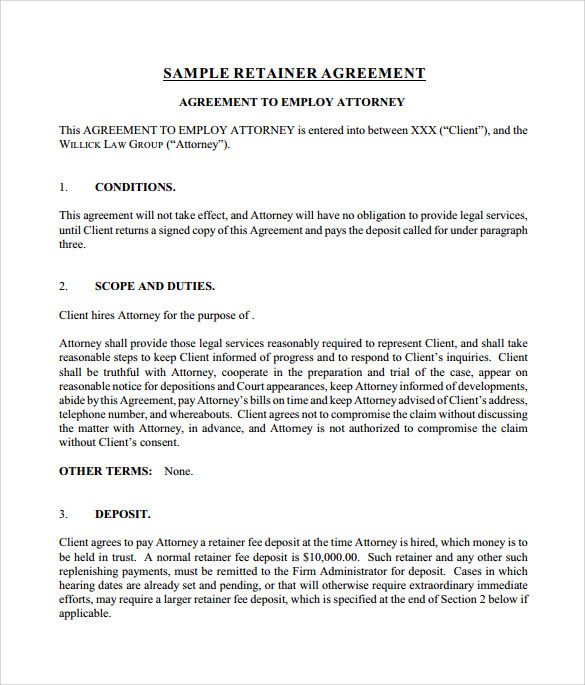 Keeping aside the fact of being duped out of a verbal agreement, sample Retainer Agreement Templates help both the client and the consultant. Before contracting someone for the work, an agreement should be furnished to be signed and kept in accordance with the verbal agreement struck upon. The job is specified clearly, the responsibilities and the payment and other details which keeps both the consultant and the client in crystal clear terms. You can use them to consult and construct your own retainer agreement or adjust them as you will. These templates can be used without any worries and issues. 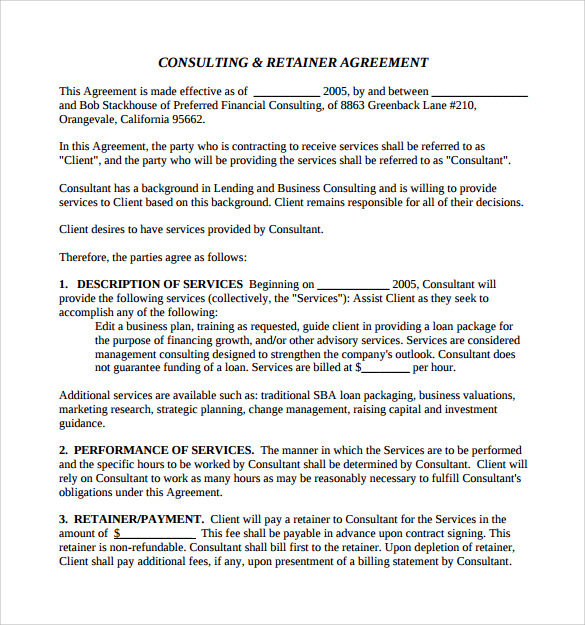 You can use the sample retainer agreements in many beneficial ways. First of all, it is easily downloadable and accessible on any platforms and devices. You can print it out and copy it for being kept by both the parties. These templates avoid you from legal and other career hassles. Expertly written content which can be customized and legalized to be agreed and signed on. It is also pre-designed and inputted with spaces for signatures and sample content. You can use these for free and use it as many times you need. Finally, it saves you time and money from writing on your own. 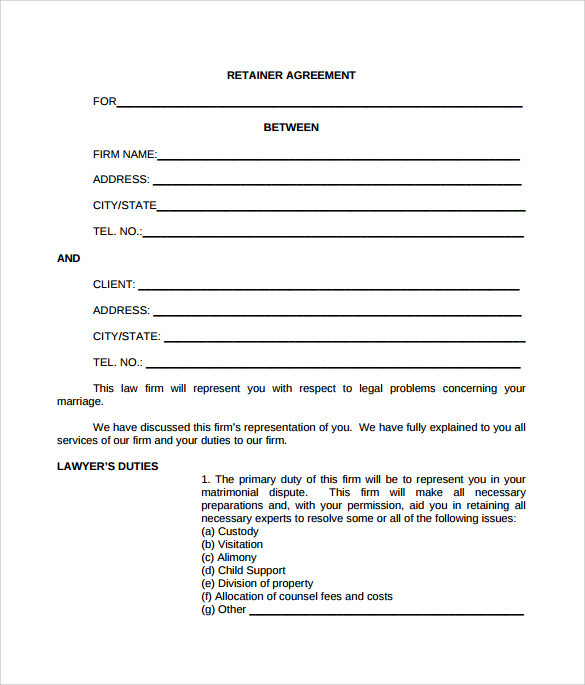 These sample retainer agreement templates are user-friendly as it comes in PDF formats which can be converted to any other format which you prefer. Avoid getting dumbfounded and fooled, use these templates and ensure a safe, secure contract that can be used without any legal action and severe ugly consequences.